The first published representation of the pre-Columbian Aztec pilgrimage from Aztlan to Chapultepec. Copia d'una antica dipintura conservata da d. Carlo Siguenza nella qualle sta s egnata, e descritta la strade che tennero gli antichi Mexicani, quando da'monti vennero ad abitare nella Lacuna, che oggidi si dice di Mesico; co geroglifici significanti inomi de' luoghi, ed altro. 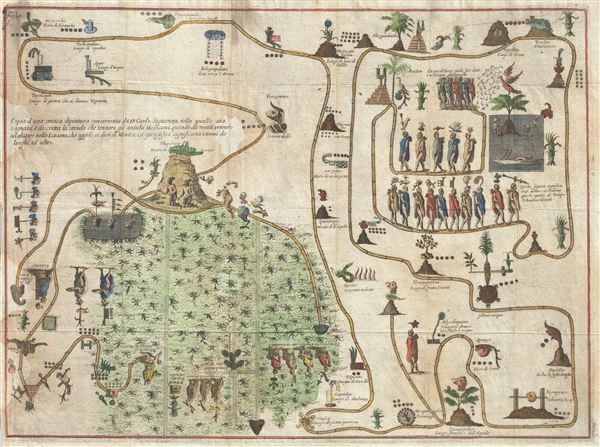 This unusual 1704 map, drawn by Giovanni Francesco Gemelli Careri, is the first published representation of the legendary Aztec migration from Aztlan, a mysterious paradise somewhere to the northwest of Mexico, to Chapultepec Hill, currently Mexico City. This map, supposedly a rendering copied from indigenous sources traces the pilgrimage conceptually and, though hard to follow as a map, embraces both cartographic and spiritual elements. The various stations on the map are labeled in both Nahuatl and loose English translation. Aztlan appears here in the upper right corner as a lake in which sits a mountain and a palm tree. The progression meanders along many paths and digressions to finally arrive upper right quadrant where we see a hill upon which rests a gigantic Grasshopper - Chapultepec. According to legend on exactly May 24, 1065 CE, the Mexica (Aztec) began an epic migration from their ancestral homeland, Aztlan, which translated means 'Place of Reeds' or 'Place of Egrets,' to the shores of Lake Texcoco, in Mexico's Central Mesa. There they founded the city of Tenochtitlan which in time spawned the vast Aztec Empire famously encountered by Hernan Cortez several hundred years later. The migration, which seems to have lasted some 250 years, is comparable in scope to the biblical wanderings of the Israelites recorded in Exodus. The legends associated with the Aztec wanderings gave birth to this conceptual map of places and events. Though most of the early stopping points on this map are difficult to correspond with factual localities, the later part of the migration seems to be rooted in the historical with sites like Chapultepec and Lake Texcoco clearly identifiable. Nonetheless, an attempt to reconcile the early points on the pilgrimage was made by no less than the renowned naturalist Alexander von Humboldt. Humboldt was a great believer in indigenous cartographic knowledge and incorporated it into his many important maps – often with significant success. Humboldt no doubt had this very map before him (he references Gemelli) when he drew is seminal 1811 map of New Spain on which many of the stops on the Aztec migration, illustrated here, are noted. Giovanni Francesco Gemelli Careri was a Neapolitan lawyer and adventurer who spent several years traveling the world in the 1690s. In Mexico, Gemelli was inspired by pre-Columbian culture and dedicated several chapters of his important book Giro Intorno al Mondo to discussing Aztec history and legends. This map, along with Gemelli's equally important representation of the Aztec Calendar, first appeared in the 1704 English edition of his work – presumably Gemelli chose not publish all of his maps and drawing in the earlier Italian edition. Though Gemelli's work attained great fame in Europe, by the end of the 18th century it was considered to be mostly fictional. It was Alexander von Humboldt who, in 1811, resuscitated Gemelli's reputation. In preparing his important map of New Spain Humboldt found himself impressed with Gemelli's in depth geographical knowledge of Mexico, which he understood could only have been obtained through actual experience. This map was published in the English edition of Gemelli's A Voyage Round the World. Neither this map nor Gemelli's important reproduction of the Aztec calendar appeared in the earlier Italian edition of his work. Gemelli Careri, G. F., Giro del Mondo de Dottor D. Gio: Francesco Gemelli Careri., (Naples) 1721. Very good. Original fold lines. Some staining upper left quadrant. Brown University, John Carter Brown Library, D704 C563c vol. 4 /1-SIZE .